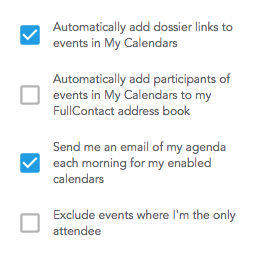 Like the name suggests, FullContact Dossiers gives you custom dossiers attached directly to your Google Calendar Events. With Dossiers, you’re able to add context to your relationships via our cloud-based address book and suite of developer APIs. How can Dossiers help me? Do you have meetings with attendees that you don't know (or don’t know very well)? If so, Dossiers will give you a well-rounded profile of your attendees. Using the power of FullContact, we can show you social profiles, occupation, demographics, interests, bio and more. FullContact Dossiers will add a dossier link to the description of your meetings that allows you to see information on the attendees of the event. It will also makes it easy to ensure that all attendees are in your address book, automatically. What are the features of Dossiers? Context rich dossiers created for the calendar events you attend. 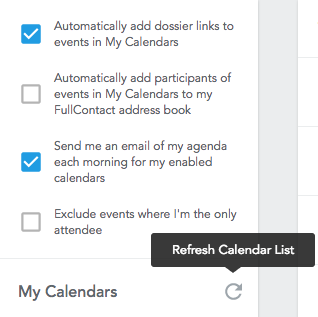 A link to the dossier automatically added to your calendar events. Optionally have all attendees of events you attend added to your address book. What calendar providers does it work with? Currently, it only works with Google Calendars. How can I add multiple Google Calendars to different accounts? If you have two Google Calendars and want to use Dossier with both, you have two options. You can simply signup for Dossier twice; once for each account. You can delegate access from one Google calendar account to the other. Let’s say that I have a FullContact account for edie@work.com. But, I also have a personal gmail calendar that I want Dossier to access that is edie@gmail.com. What you can do is go into the edie@gmail.com calendar account, and delegate write access to edie@work.com. To do this, go to the calendar you want to share, in this case edie@gmail.com. Click the gear icon, then click Settings. Now select Calendars, and find the calendar you wish to share. Click on Edit Settings under the Sharing column. Now in the Share with specific people section enter the account you wish to share with, in this case edie@work.com. Set Permission Settings to be Make changes to event. Now select Add Person and then Save. You may then need to check your email to possibly approve accepting the new calendar (edie@work.com) though in some cases the sharing may be automatic. At this point return to https://dossier.fullcontact.com. 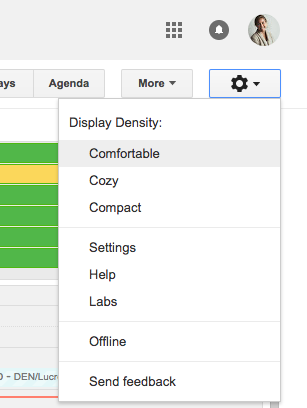 From the dashboard, select the refresh calendars button. Your new calendar should show up under My Calendars as an option to select to include in getting dossiers. I’m noticing a “Bad Gateway Error” when signing up. What’s the fix? If you’re noticing this error, go back to this link and click Get Started again. The info associated with my company in Dossiers is incorrect. How can I edit this? Please send an email to our Support team and we will fix this in our backend. Why am I only seeing two weeks in my Dossiers webpage? We currently have it set to display two weeks as this is the query we give Google. How can I disable / delete my Dossiers account? In your Dossiers account, click on your profile photo in the upper-right-hand corner, then click Disable Account. 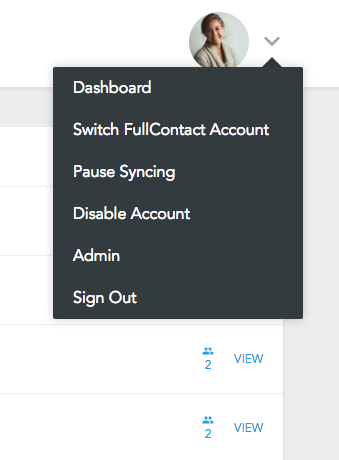 What does Pause Syncing do? Pause syncing with prevent Dossiers from syncing new events. What are the Settings in my Dossiers account? Below are the different settings available in your Dossiers account. You can pick and choose which settings you want selected. What does the Exclusion List mean? With the Exclusion List, you can enter in domains and emails that you do not want info to show up for when viewing a dossier. This only applies to the user when they are logged in and viewing a dossier. If it's the public view, it will show everyone.